The Cautley Cup was introduced in 2010 by the Colonel Commandant Royal Marines Cadets, Colonel Paul Cautley OBE CMG DL, to test the military and field skills of the Royal Marines Cadets of the Volunteer Cadet Corps, and to see how they live up to the Commando Spirit. 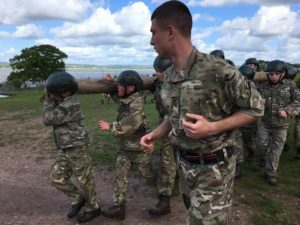 The competition is held annually at the Commando Training Centre Royal Marines in Lymsptone, usually in May, and sees a team of 10 junior and 10 senior cadets attend from each Division of the RMVCC. The Cautley Cup is the VCC equivalent to the Pringle Trophy and Gibraltar Cup of the CCF and SCC respectively. The cadets arrive on a Friday night to be welcomed by the OC of the competition, usually an officer from the Corps Colonel’s department at CTCRM, and then shown to their ‘luxury’ accommodation. A written test and kit layout assessment is normally held that night before the cadets get a good night’s sleep ready for a long day on the Saturday. After an early breakfast on the Saturday all the teams are taken to nearby Woodbury Common Training Area, a facility well known by anyone who has ever passed through Lympstone for training. The teams are then set off on a ’round robin’ of visiting various stances distributed widely across the common. These stances range from map reading to first aid, command task to observation skills test. The cadets carry all their own kit and can cover up to 6km whilst also spending a lot of time carrying out the tasks at each stance. By around 1630 the teams should have finished and are then taken back to CTCRM for a much welcomed shower and to clean their kit ready for the next day. After dinner the teams will then meet again for some fun sports and swimming activities, and spend some to get to know the teams from the other RMVCC divisions. Another early breakfast sees the cadets mustered on the famous Bottom Field at Lympstone for Sunday’s activities. Here, the teams are put through their paces undertaking physical and team challenges such as a Land Rover pull, obstacle course and ammo box race. It is during this morning, especially after a tiring day beforehand, that cadets need to find all the Commando Spirit possible to continue working as a team and achieve some good marks. Sunday morning concludes with one of the senior cadets from each team attempting the regain over the water tank (fully supervised of course) and then off to get showered. At about 1300 the team re-assemble in the Falklands Hall eager to find out the results. The cadets with the overall best scores from the senior and junior teams are then presented with The Cautley Cup by Colonel Paul Cautley or the Corps Colonel. There are usually awards for the Best Instructor and Best Overall Cadet. The cadets then ‘square away’ their accommodation, bid their farewells and head home. The winning team then competes against the winners of the Pringle Trophy and Gibraltar Cup to be named Best Overall Royal Marines Cadet unit and win the prestigious Portsmouth Cup (so named as the first Royal Marines Cadet unit was formed in Portsmouth – indeed it was a VCC unit). If you think you could ‘Meet The Challenge!’ of participating in the Cautley Cup competition then why not consider joining the Royal Marines Cadets of the VCC?